PROVOCATION - Illegal immigrants on Kalymnos stage protest - Tear Up Greek Flag! Immigrants who apparently ILLEGALLY entered the island of of Kalymnos earlier this week staged a protest and according to the FreskaNEA.com website they even had the audacity to tear up the Greek flag! According to the report, the incident began when police officials asked the immigrants to hand over their documents. For unknown reasons, the immigrants took offence, became hysterical and then began vandalizing the Greek flag! The same immigrants, who we repeat ILLEGALLY invaded the island, then began to complain about the red tape needed to obtain the refugee status (or the documentation needed for this status). 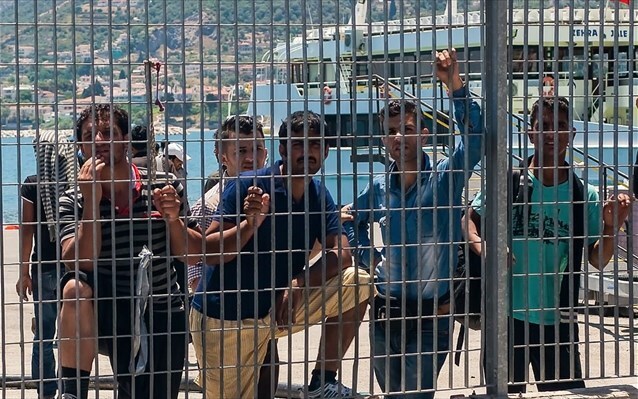 They shouted at authorities to hand them the documents (without the proper checks) and allow them to sail off to Athens. Tensions remained high for quite a bit of time and according to the same report even local port officials were abused. Meanwhile, island residents are pressuring local authorities to remove the immigrants from public areas on their island (or in places where the immigrants -by their own initiative- have made makeshift accommodations). The incident was even reported by MEGA channel (video below) but (as expected) they did not mention that the Greek flag was vandalized and instead only focused on the chaos. Editor's Note: ANYONE who dares to burn, tear, or even vandalize the Greek flag needs to be thrown out of this country IMMEDIATELY. There is no ifs and or buts. There are plenty of other countries these people can go to if they truly are refugees. Why not go to S.Arabia or to Qatar? Try tearing up the flag in these countries, or better yet try abusing a police officer in places like Germany, France or New York. In the first case your head will fly off and in the second you will either be shot down by plastic bullets, or real gunfire. Whereas Greece has to be tolerant of human trafficking, because we live in fear of being called racists. How ridiculous is that? If illegal immigrants burned the American flag on a street in New York City, the police department there would have called in the swat team, the national guard or would have even shot the provocateurs! We have had it up to here with all of this, and all this political correctness. It is so clear, our nation is under threat; we pity all of those who are forcing all of this human trafficking down our throats. Enough is enough!